HARRISBURG, Pa. – The 2018 National Frozen & Refrigerated Foods Convention set a participation record with over 1,260 total attendees who held an estimated 2,200 business appointments with leading retailers. 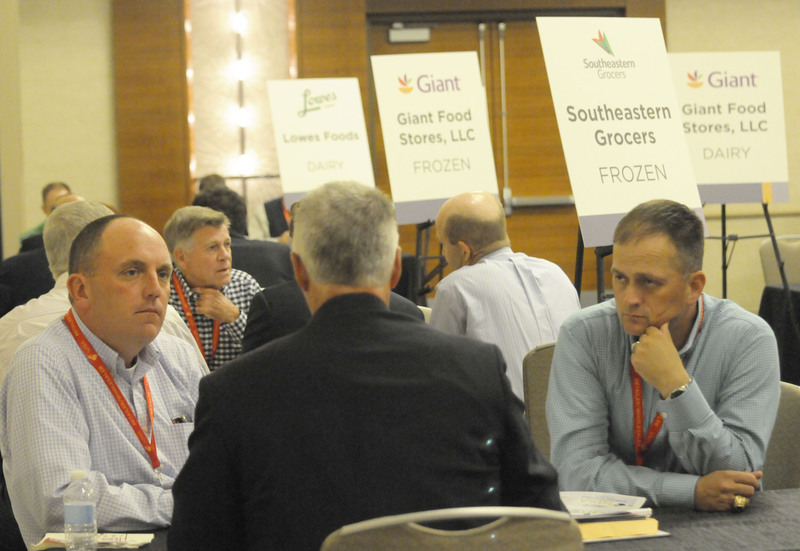 The event held on October 20-23, 2018, at the Marriott Marquis San Diego, San Diego, Calif. and hosted by the National Frozen & Refrigerated Foods Association (NFRA), was designed to bring together leading companies from every segment of the industry in one venue to efficiently and effectively conduct the maximum amount of business in the least amount of time. Eighty-six retailers booked meeting rooms to hold customer business appointments. According to a survey of convention attendees, more than half the retailer participants held more than 20 appointments lasting at least 30 minutes each throughout the event. In addition, some retailers participated in 6-minute speed meetings to accommodate new members and smaller manufacturers who may have difficulty getting regular appointments. Sixteen retailers set aside time for speed meetings with 74 manufacturers creating an additional 443 meeting slots which was double the number of speed meetings in 2017. From beginning to end, the convention was structured to help attendees make valuable connections. The opening Taste of Excellence Reception on Sunday, October 20, included 53 manufacturers, including 10 new NFRA member companies, showcasing over 170 of the latest frozen and refrigerated food products. Headlining the convention were two popular speakers offering their unique insights. At the Monday, October 21 breakfast, Brian Solis, Principal Analyst and Futurist at Altimeter, discussed disruptive technology and its impact on business. During the Tuesday, October 22 breakfast session, Todd Buchholz, former White House Economic Policy Director, shared his thoughts on economics, finance and business strategy. The convention also served as a platform for recognizing NFRA leaders and award recipients. The Annual Membership Luncheon on October 21 included the induction of NFRA’s new officers and directors. Dave Jones, VP Industry Initiatives, Kellogg Company, was elected as Chairman of the Board. Mr. Jones also led a panel discussion with students from St. Joseph’s University food marketing program sharing their thoughts and shopping habits related to the frozen and refrigerated categories. A Networking Reception on October 21 recognized the 2018 Golden Penguin winners for the March Frozen Food Month, June Dairy Month and June/July Ice Cream & Novelties promotions. Award winners with the highest scoring entries were revealed as Top Marketers during the reception. Five companies were named Top Marketers for March Frozen Food Month including: Frozen & Refrigerated Food Council of Northern California, The Pictsweet Company, Albertsons Southwest Division, IMPACT Group and W. Lee Flowers and Company. Four companies were named Top Marketers for June Dairy Month including: Frozen & Refrigerated Food Council of Northern California, Land O’Lakes, Safeway Eastern Division and C&S Wholesale Grocers. Three companies were named Top Marketers for the Ice Cream & Novelties promotion including: Graeter’s Ice Cream, Chris’ Food Center and IMPACT Group. The convention closed with a luncheon that included the presentation of Frozen & Refrigerated Buyer magazine’s Retail Patriot Awards honoring those companies that have gone above and beyond in support of our active and retired military and their families. Kroger and SpartanNash were both recognized as Retail Patriots. The 2019 NFRA Convention is set for October 12-15 at the Orlando World Center Marriott, Orlando, Fla. Registration for the event opens March 1, 2019. For more information, visit NFRAConvention.org. NFRA is a non-profit trade association representing all segments of the frozen and refrigerated foods industry. Headquartered in Harrisburg, PA, NFRA is the sponsor of March Frozen Food Month, June Dairy Month, June/July Ice Cream & Novelties and the Cool Food for Kids educational outreach program.